The League is live this Thursday at 19:00 CET with DiNG vs GoHard, followed by Oops vs eSuba at 20:30 CET. Did you miss this week's broadcast? Not to worry – we have all the best action compiled for you in our weekly highlights video. Remember, the WGL portal is also up and running, so if you want more information or if you are interested in what's happening in the other regions too, go check it out! You have a chance to win a premium tank every day by completing the quests during the WGLEU matches on wgl.gg/watch! After taking an impressive 3:0 lead, Go Hard were sitting pretty and looking set to perhaps take the match 5:0. DiNG however showed great resilience and mounted a fantastic comeback, winning five rounds in a row. The highlight of the match was an impressive cap on Himmelsdorf by DiNG, where barely any shots were fired. eSuba took an early lead, winning the first round on Prokhorovka. Oops then showed great courage to come back and lead eSuba 4:1. At match point on Cliff, eSuba fought back to make the score 4:2, drawing Oops into a fight where their arty couldn’t support them. Going into map number four, Oops had the defence for Steppes and immediately covered both bases with quick climbs. eSuba couldn’t break them down and Oops were able to take the match 5:2. The last time these two teams met, Utopia prevailed with a 5:3 result. 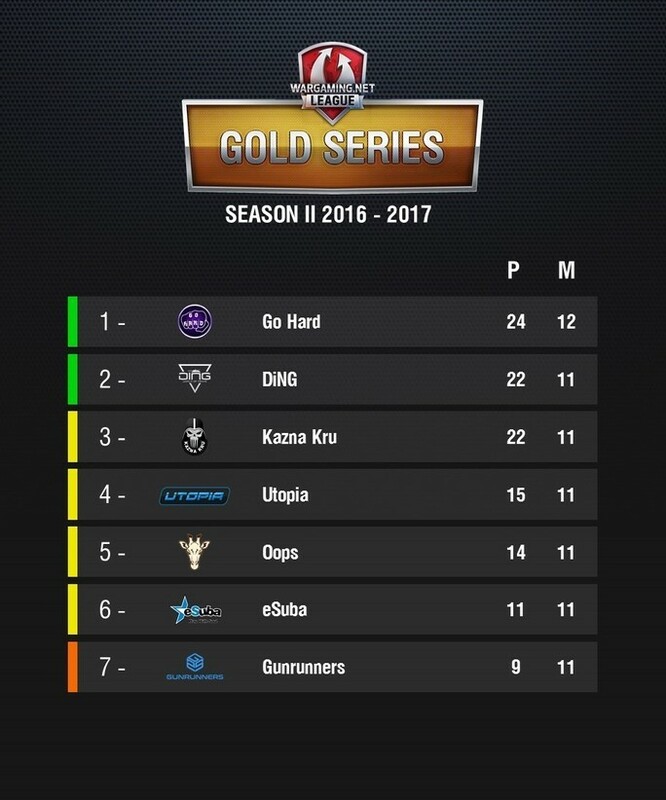 DiNG were looking to set things straight and also stay ahead of Go Hard in the standings. For Utopia it was a matter of staying within range of the top 2. The match was superb, with battles of positioning, original strategies, risk-taking moves, and baits. At the end, it was DiNG that took the match 5:4. Oops desparately needs points to catch up with the other teams and the same thing is true for Gunrunners, who are currently last in the standings. On paper, Oops should have the advantage but Gunrunners can occasionally pull surprises from their sleeves... Which they did, starting with their first attack round where they picked a surprising Jagdpanzer and a Tier VIII Scorpion tank destroyer on Ghost Town. The match was a nice watch and ended on a solid win for Gunrunners. In round one, Go Hard tried to counterplay Gunrunners, but their trap didn't work out and Gunrunners took the win. The teams traded rounds until 2:2, but from there Go Hard took control of the operation. Ghost Town went badly for Gunrunners, who lost the two rounds, before being fully defeated on Prokhorovka. In the one-sided final battle, Gunrunners didn't seem to know how to respond. A very close match between the two teams where they traded blow for blow. On the last map, Ruinberg, Go Hard looked like they had it whey they picked up their attack, but Kazna kept pace and pushed them to a tie breaker. Unfortunately for Go Hard, the tie breaker was set to be played on Murovanka, a map Kazna are undefeated on this season. It didn't go any different this time. After playing four tie breakers in a row, Kazna obviously needed a break from long, drawn out matches. Their message was delivered as they made quick work of eSuba in the shortest match of the season. Wherever they went and whatever they tried, eSuba seemed to lack the necessary conviction to even score a round. Oops have been struggling this season, and after losing to Gunrunners, they had a tough task ahead of them with Utopia as their opponent. At 0-2, the situation seemed dire for them, but unlike their previous matches, they were able to swing a comeback to win the match 5 : 3.